What is the difference between Sprinkler Irrigation and Drip Irrigation? Irrigation is an artificial method of ensuring plants get enough water through pipes, ditches, drips, sprinklers etc. The main aim of using irrigation is to curb inadequate rainfall, maintain the landscape and help crop growth. Thus, it’s a very critical practice in farming. Many farmers in Kenya however, find it hard when it comes to choosing a system that better suits them. The two common systems are sprinkler and drip. This is a system that provides water directly at the root zone of the plant. Water is controlled and drips slowly on the plants roots exactly where it is require thus saving a lot of water. Through drip system, water is saved up to 50%. Through this system, water application is frequent ensuring the ideal moisture level is maintained at all times. Water is used at maximum level. No water being available to weeds. Less weed growth and restricts population of potential hosts. Low labour and relatively low operation cost. Improved infiltration in soil of low intake. Ready adjustment to sophisticated automatic control. No runoff of fertilizers into ground water. Less evaporation losses of water as compared to surface irrigation. Management of green house is paramount. Why? High cost compared to furrow. Sprinkler is a type of pressurized irrigation that consists of applying water to the soil surface using mechanical and hydraulic devices that simulate natural rainfall. It is a method by which water is distributed from overhead by high-pressure sprinklers, sprays or guns mounted on risers or moving platforms. Expansive land leveling is not required. Water saving intensity can be changed in accordance with the infiltration capacity of soil. High efficiency due to uniform water distribution. No special skills trained personal can operate the system reasonably well. Ease and uniform application of fertilizers and pesticides through irrigation system. Possibility of applying minute quantity of water for germination and other irrigation systems. Frequent and light irrigation possible giving better response from the crops. Increase in yield and quality, early ripening, water conservation and alternative value of specific period saving of labor, machinery, fertilizer and pesticides. Soil moisture is maintained at optimum level by sprinkler and 20 higher yields are obtained of crops and the quality of other crops is also good. High and continuous energy requirement for operation. Under high wind condition and high temperature distribution and application efficiency is poor. Highly saline water 7mm hos/cm causes leaf burning when temperature higher than 95 F.
When lands have been already leveled and developed for surface or other irrigation methods sprinkler irrigation is not so economical. Loss of water due to evaporation from the area during irrigation. Above canopy sprinkling may cause washing of spray, materials and aggravate the incidence of pests and diseases. The above information is only meant to make you make better decisions. Drip irrigation system, drippers in Nyeri, FARMING IN KENYA, how to know which irrigation system to use, Irrigation shemes in Kenya, sprinkler irrigation scheme, what is irrigation? Also Read: How well-planned are you for tree fruit farming this season? to have more flexibility in their systems/operations as the ability to access water at times when it would otherwise be hard to achieve good plant growth (due to a deficit in soil moisture) is imperative. Producers can then achieve higher yields and meet market/seasonal demands especially if rainfall events do no occur. to have ‘insurance’ against seasonal variability and drought. to maximise benefits of fertiliser applications. Fertilisers need to be ‘watered into’ the ground in order to best facilitate plant growth. to use areas that would otherwise be ‘less productive’. Irrigation can allow farmers to open up areas of their farms where it would otherwise be ‘too dry’ to grow pasture/crops. This also gives them the capability to carry more stock or to conserve more feed. to improve the capital value of their property. Since irrigated land can potentially support higher crops, pasture and animal production, it is considered more valuable. The value of the property is also related to the water licensing agreements or ‘water right’. to cost save/obtain greater returns. The cost benefits from the more effective use of fertilisers and greater financial benefits as a result of more effective agricultural productivity (both quality and quantity) and for ‘out of season’ production are likely. The vast majority of irrigation water use is pumped directly from a water source (river, creek, channel, drag line, hole, dam or bore). Irrigation scheduling is the process by which an irrigator determines the timing and quantity of water to be applied to the crop/pasture. The challenge is to estimate crop water requirements for different growth stages and climatic conditions. To avoid over or under watering, it is important to know how much water is available to the plant, and how efficiently the plant can use it. The methods available to measure this include: (i) plant observation, (ii) feel and appearance of the soil, (iii) using soil moisture monitoring devices; or (iv) estimating available water from weather data. Irrigation water travelling over soil can cause erosion. The excessive displacement of the top soil can also affect soil fertility (and hence crop yields), it may also clog drainage ditches and streams (silting), harm aquatic habitats, foul waters used for recreational activities, and increases the need for water treatments. Downgraded product quality and reduced yield. Drip irrigation can boost crop production by way of more than 30% at the same time as the use of 30 to 50% much less water than a sprinkler. It can also save you defects in fruits and greens while saving you time. Right here are our 5 concerns for planning a drip irrigation system for huge-scale or small market farmers. Determine the quality of your water supply for your drip irrigation. Factors can also include such things as pond water source that will require installation of a filtering machine or an adjustment of the water PH, depending on your plants. Familiarize yourself with the elevation of the plot/field you plan to irrigate, as it will determine how you size the system and adjust water flow. A 2.3-foot change in elevation, for instance, results in a gain of 1 pound of water pressure going downhill, or loss of 1 pound of pressure going uphill, requiring pressure compensation within the system on steep slopes. Topography, water flow rate and distance also will affect the size of pipes you’ll need. Will you automate your drip system? Depending on the complexity and size of the system, you may need to split watering times between different zones to water spaces incrementally, based on the output of your pump or the water needs of different crops. Automation ensures consistency in soil moisture and in flow, versus turning the water on and off at irregular intervals. The latter is important if you use the drip system to fertilize. Think ahead. As plants mature, they require more water, which is especially important if you are irrigating perennial fruit crops. Build the system with the capacity to supply the optimum amount of water plants will need at maturity. If your irrigation water comes from the same well your home uses, the pressure tank may need to be upsized to reduce pump cycling and possible pump burnout. Or, you can irrigate at night when family water use is minimal. Permit for expansion whilst putting in your device. For systems 1 and1/2 acre or larger, scaling for expansion up front will save money, as completely mounted pipes need to be buried underneath the frost line and the value of trenching in pipelines is high-priced. Customize your pipes to accommodate expansion as you increase your operations. Doubling the pipe diameter will quadruple the ability water float rate. Drip irrigation is not a set-and-neglect-it solution. Systems need to be checked each day as emitters might also plug and rodents may additionally cause damage. The system additionally need to be drained to winterize it. Tree fruit growers may use two types of irrigation systems: solid set sprinklers and drip. Both irrigation systems have their own advantages and disadvantages for a given application. Once a particular type of irrigation system is chosen, an irrigation equipment dealer or a qualified agricultural officer can help you customize it for the particular orchard block and fruit crop. With this system, laterals are buried in the tree rows with a riser and impact sprinkler exposed above ground. These systems are full coverage systems that apply water to the entire tree and orchard floor. The initial investment cost of this system is high because of the cost of trenching and placement of the PVC laterals and sprinkler heads. Annual operating costs are high because of pumping costs. Drip irrigation uses polyethylene laterals with emitters to deliver water directly to individual trees. In practice, only about 40-50% of the orchard floor will be wetted. 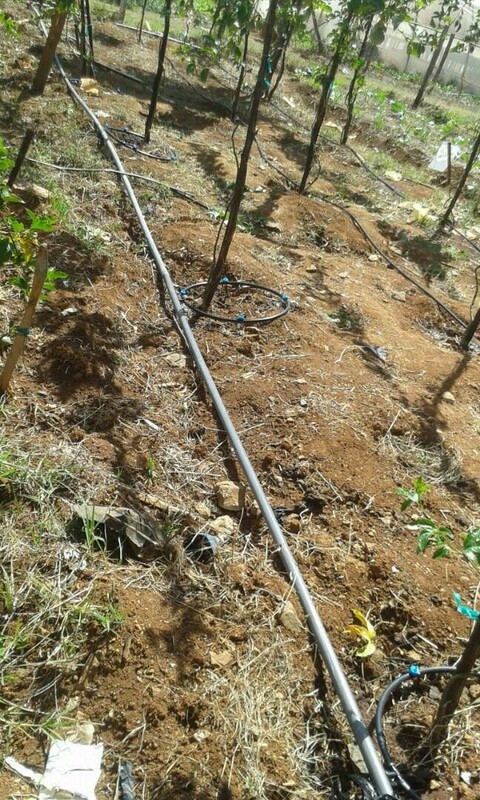 With drip irrigation the PVC submain and main water supply are usually buried to facilitate machinery operations. These systems are easily adapted to chemigation and because they do not wet the entire tree, they facilitate conventional pesticide applications. Once you have acquired an irrigation system, you must decide when to irrigate, how much water to apply, and how you will use and maintain the equipment. Irrigation systems must be designed to ensure that both the water supply and the irrigation system can meet peak demand. Plant root depth, canopy development, growth habits, and nutrient requirements in a given climate largely determine the irrigation schedule. Soil-infiltration characteristics determine maximum water application rates. Actual water use will vary daily throughout the season, so growers must develop a method for ensuring that the crop has a sufficient amount of water available. Several methods are used to determine when to irrigate, and some of these methods are more reliable than others. By the time plants show signs of water deficiency, such as wilting, plants have been stressed and their growth slowed. Irrigation at this point may save the crop, but production already has been limited. The appearance of the soil after being squeezed by hand can be used to estimate water content. A common mistake is to feel the soil on the surface rather than around the root tips, where most moisture is taken up. You can avoid this problem by using a soil probe to sample soil in the crop root zone. Plant water demand also can be estimated daily (based on crop development and climate conditions) and then compared to the soil’s water-holding capacity. Irrigation should begin when the stored soil moisture approaches 50 percent of the available capacity or the plants will become stressed. Moisture content should be measured periodically to verify water use and moisture depletion estimates. With experience, this water budget method can be quite reliable and can be used to predict when irrigation should begin. The irrigation schedule can account for average weekly precipitation and can help you plan irrigation to apply the difference. However, rainfall amounts are unpredictable, so this method can lead to deficits or excesses that can limit crop performance. For small-fruit crops, growers may wish to raise the water demand to 2 inches per week during fruit development, especially on well-drained soils. Appropriate use and maintenance of irrigation equipment, both during the irrigation season and while in storage, will increase its life span and reduce operating and maintenance costs. Irrigation equipment dealers can provide you with guidelines for operating and caring for your equipment. The pumping unit and control head will require the most maintenance in terms of lubrication, cleaning, and protection from dirt, moisture, freezing, and animals. Leaking pump seals and pipe gaskets should be replaced when necessary. Sprinkler nozzles that have worn more than 1⁄16 inch larger than specified or emitters that are clogged should be replaced. Mains and laterals, particularly in trickle systems, should be flushed periodically to remove buildup of precipitates and sediment. Equipment used in freezing weather must be properly lubricated and should be self-draining. Careful use and continued maintenance of irrigation equipment will help ensure many years of trouble-free performance. For more information about tree fruit irrigation, visit our offices or give us a call. Also book your tree fruit seedlings today. Drip irrigation is a micro irrigation method in which the rate of water application is very low and without any pressure. i.e., drop by drop. Drip irrigation is based on the basic concept of irrigation only the roots zone of crop, rather than the entire land surface on which the crop is grown. Water flows from the emission points through the soil by capillarity and gravity. The soil moisture content of the crop root zone is maintained at near optimum level to facilitate optimum crop growth and production. 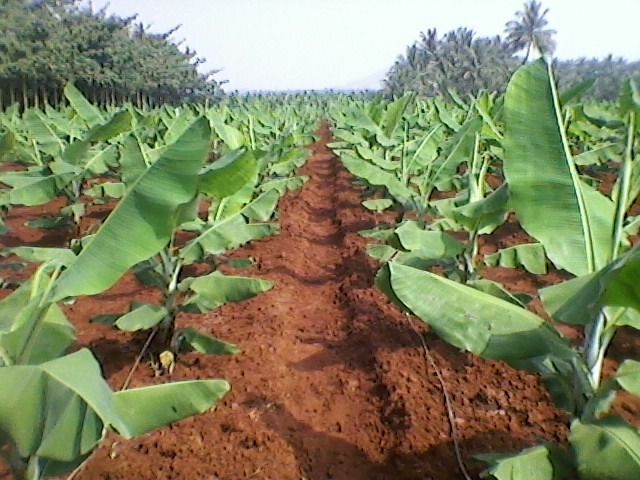 Drip irrigation is useful for fruit crops Banana, Grapes, Citrus, Pomegranate, Papaya, Pineapple, Watermelon, Sweet lime, Mango. High cost: drip irrigation systems are expensive because of their requirements of large quantity of piping & filtration equipment to clean the water. Expense: Initial cost can be more than overhead systems. Waste: The sun can affect the tubes used for drip irrigation, shortening their usable life. Longevity is variable. Clogging: If the water is not properly filtered and the equipment not properly maintained, it can result in clogging. Drip tape causes extra cleanup costs after harvest. You’ll need to plan for drip tape winding, disposal, recycling or reuse. Pumping set: To create a pressure about 2.5 Kg/sq. cm to regulate the amount of water to be supplied. Filter: To filter the water in Order to remove the suspended impurities from water. Main lines: It is a Distribution system in drip irrigation. Rigid PVC and high-density polyethylene pipes are used as main pipes to minimized corrosion and clogging. Sub Main: It is usually connected to the main lines through a control valve assembly. The function of its to distributes water uniformly to a number laterals. Drippers/emitters: It is fitted to a drip irrigation lateral and intended to emit water in the form of drops or continuous flow at emitter rates not exceeding 15 liters/hr. Drippers function as energy dissipated, reducing the inlet pressure head in the lateral, which generally range from 0.3 to 1.5 atmosphere. Drip irrigation system is an economical and very efficient system of irrigating for fruit crops, vegetables, row crops etc. Drip irrigated crops use less water compared to overhead irrigated crops. Drip irrigation increase yield. For more information call or visit our offices. Book your seedlings today!! !